Morning city tour of Zagreb including the fortified Upper Town, the city’s historical center, St. Mark’s Church with its multicolored roof, the Cathedral, the Croatian National Theatre and the University. After the city tour, drive to Plitvice and tour the Plitvice Lakes National Park on the UNESCO’s List of World Natural Heritage. Sixteen lakes, each at the different level, are joined in a series of cascading waterfalls. Surrounded by dense wood Plitvice Lakes are a natural phenomenon of a rare and unique beauty. Dinner and overnight in Plitvice. Morning departure for Trogir where we visit the Cathedral of St. Lawrence. Continuation to Split; city tour of Splitincluding theDiocletian’s Palace on the UNESCO’s List of World Cultural Heritage, with the Peristyle, the Jupiter’s Temple and the Cathedral. Dinner and overnight in Split. Morning departure for Mostar. 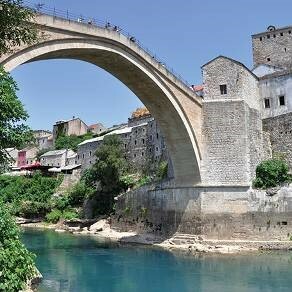 Sightseeing tour of the Old City of Mostar, recently included in the UNESCO’s List of World Cultural Heritage. We tour its elegant Bridge, Old Bazaar, the Mosque and a typical Turkish house. Continuation to Sarajevo. Afternoon city tour of Sarajevo, including Baščaršija and Gazi Husref Bey Mosque.Dinner at local restaurant, Oreint-style. In the morning sightseeing tour of Belgrade. The tour includes a visit to the imposing Kalemegdan Fortress,dramatically set at the confluence of the Sava and Danube Rivers. You´ll also see Republic Square and Knez Mihajlova Street, Saint Sava Temple, the largest Orthodox Church in the city, and Tito’s Memorial. Continuation to Zagreb for dinner and overnight. If changes become necessary for any reason, substitute hotels will be similar to those listed above.